Railway jobs applications are invited from all Indian candidates who are wishing to apply for Railway jobs in India 2018. 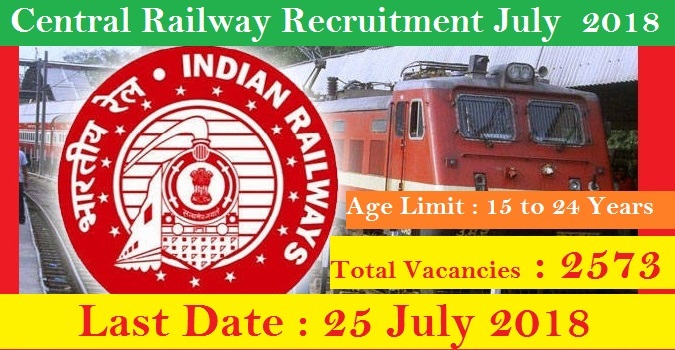 Central Railway issued a notification related to this Indian Railways recruitment process, in which they said that they need fresher Indian candidates for these job profiles. We took this piece of information from the official PDF file only. Here we try to explain all the things in an easy manner, so that students can easily understand all facts related to these railway jobs in India. Indian applicants who passed in their 10th class examination, after that successfully completed ITI course can apply for this railway recruitment process 2018. Railways recruitment board decides to fill up total 2573 railway Jobs through this recruitment process. More Information about this central railway recruitment process you can also check the official website where they published the official notification. We also share the reference links below in this article. Read the whole article carefully before applying these Government jobs in India under Indian railways. The table below contains the basic information for which this recruitment process is going to be take place. Check the table below to know about the job profile and various vacancies. Below in the table we are going to explain about unit/trade wise vacancies details in various Clusters. Check the table below for more information about the vacancies according to various unit and clusters. What Eligibility Criteria required for applying these Central Railway jobs? Candidates who have passed in their 10th class with minimum 50% marks, in aggregate and must have a National Trade Certificate in the relevant trade issued by the National Council for Vocational Training. That means must have an ITI certificate in the relevant trade. Applicant’s age must in between 15 to 24 years for applying these railways jobs in India. How much is the application fee for this Indian railways recruitment? Paying Method for application fee: Candidates can pay the examination fee for applying these railway jobs in India in the following ways: Pay exam fee through debit card / credit card / Internet Banking / SBI Challan etc.”. What is the procedure for applying these railway jobs? Those who are interested in these Government jobs in India under railway department can apply online through the official website of central railways. The process for applying online will be started on 26th June 2018. We share the direct link for applying below under important link section. 25 July 2018 Last Date for apply online.